It’s been a busy few months here at blk.io with supporting the milestone 3.x release of web3j and getting our first enterprise product built. One of the challenges we’ve always had when working with private Ethereum or Quorum blockchain networks is the lack of a tool like Etherscan for viewing what’s been happening in the blockchain. We decided to build a blockchain explorer to address this shortcoming. 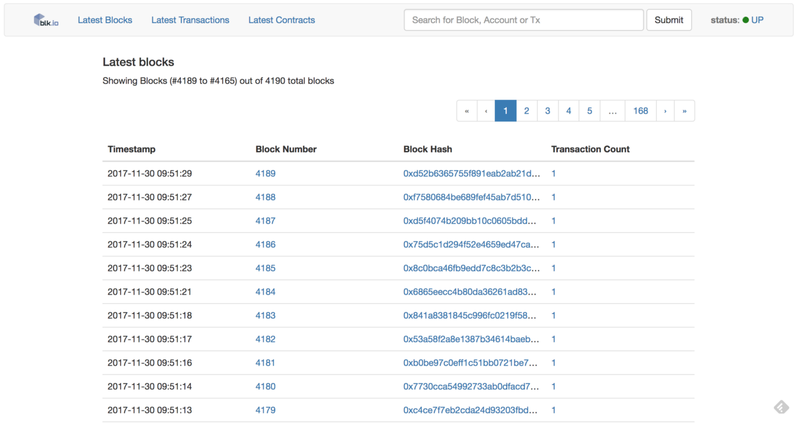 Our block Explorer supports both Ethereum and Quorum networks, and provides the ability to search for and view recent blocks, transactions and deployed smart contracts. It’s super responsive, event at scale — we’ve tested in on live networks with millions of transactions across millions of blocks. We’ve kept the explorer experience as simple as possible — this includes integrating it with your network. All that is required to get up and running with it is details of the node you want to sync from, the Explorer takes care of the rest. Quorum’s transaction privacy is also well catered for. When a private transaction is encountered, the Explorer marks it as private, and will request details of the transaction on demand from the Quorum enclave, keeping your data private. A challenge when working with smart contracts is understanding what actions they are performing when you interact with them. The creation of log events on the blockchain is the recommended method of recording state changes in smart contracts. However, making sense of what actions those events represent is non-trivial. To address this, our Explorer provides a contract registry. Using this registry, you can associate information about smart contracts with the Explorer, so when you are viewing the events associated with a transaction, you can see details of the event that was called and its parameter values. For instance, in the below example we demonstrate viewing an ERC20 Transfer event. We’re still investing heavily in the development of our Explorer, and there’s a lot more functionality we’re working on. Ultimately we want to get to the point where users think of the information contained within less like a blockchain, and more in terms of the underlying business processes that it is supporting. We’re working on a free version of the Explorer that we’ll make available in the coming weeks. In the meantime, if you have a private Ethereum or Quorum blockchain network that you want to use the Explorer with, please get in touch to find out more.